This is an encore post from November 16, 2010 (one of my very first posts here on WILD ABOUT HARRY). I thought this was worth a revisit as today marks the 113th anniversary of the Houdini-Boudini challenge. From Houdini The Key by Patrick Culliton. One of the more curious and obscure episodes in Houdini's early career was his encounter with rival escape artist, Jacques Boudini. Many cast skepticism on this "challenge," suspecting the entire thing was staged, and it very well could have been. Houdini was not above staging such encounters for publicity, and the fact that the newspaper men on the scene didn't entirely buy it could explain why Houdini never retold this story or featured it in pitchbooks, the way he boasted of besting other rivals like Cirnoc and Kleppini. One of my first forays into independent research (when I was 16) was to use the clues in Christopher to search the microfilm archives at Cal State University Northridge for an account of this event. What I found was this terrific article from the New York Times dated September 21, 1905 (which mistakenly calls him Bondini). I've transcribed it below so we can all relive this forgotten challenge exactly as it happened back in the day. It's Houdini vs. Boudini (or Bondini). Enjoy! A Case of Professional Jealousy Between Houdini and Bondini, the Press Agent Says – Houdini Won. Landlubbers with fertile brains encroached upon the field of the marine yarn spinners yesterday with a performance that transcended anything they had ever thought of. The performance was real enough while it lasted, two minutes and forty seconds. In those two minutes and forty seconds it looked as though Jacques Bondini, who had gone down to the bottom of the harbor, (the bottom was thirty feet down,) was likely not only to break the literal shackles which bound him, but the shackles of life as well. Harry Houdini, the "sensational perplexer and mysteriarch," professional shackle and handcuff breaker, had made a wager with Jacques Bondini that he could break manacles from his hands and ankles quicker than he. Houdini has been abroad startling Kings with his performances of handcuff breaking and making them wonder what to do next with their criminals. When recently Houdini returned to this country he found that Bondini, his erstwhile pupil, was usurping his field here. That's the story as the press agent tells it. At all events Houdini challenged Bondini to a shackle-breaking match under water. The victor was to get $500. A group of newspaper men and artists went to Atlantic Basin on the tug Fred B. Dalzell to see the performance. The Captain of the tug is John Gannon, and the contestants made him referee. In the Basin Capt. Gannon tied fast to a float. The two shackle-breaking artists stripped for the contest. Houdini wore tights under his clothing. Bondini did not. 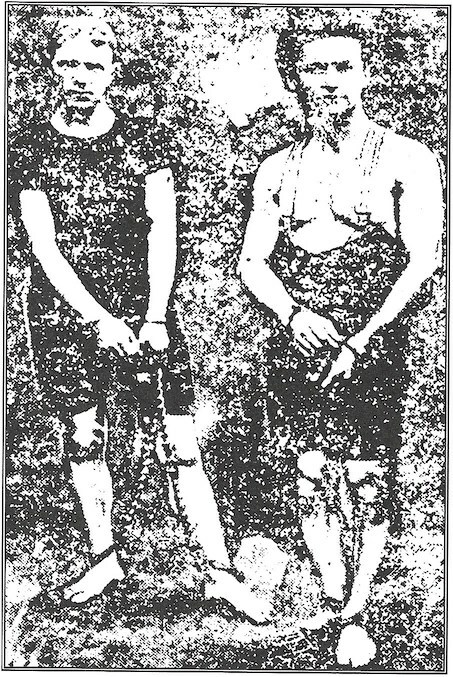 Both men were shackled in five minutes. Hand and ankle cuffs were fastened about the arms and ankles of both. Then ropes were fastened about their waists and they were lowered into the water. "No!" chorused the crowd on deck. Houdini stuck his hands above water to show that he had freed them of the shackles and disappeared again. A minute later the head of Bondini appeared above the water. He looked gloomy, and it was obvious that he was not having any luck. He was down again in a minute. In another minute and ten seconds the head of Houdini appeared. "Is Bondini up yet?" he asked. The answer was discouraging, so far as Bondini was concerned, but encouraging for Houdini. Houdini went down a third time, but not until he had stuck one foot above water to show that he had unfastened his ankle bracelets, too. Houdini came to the surface again in a minute and motioned to be pulled up on deck. Then the men holding the rope to which Bondini was tied got busy. More dead than alive, he was hauled on board. He had to be rolled and rubbed before he came to. He had failed to unfasten either the handcuffs or the ankle bracelets. "I swallowed some water," was only explanation. The Dalzell then steamed back to the Battery. The principals went to 40 Greenwich Street, where it was said the money would be turned over to Houdini. Nobody saw it, but the press agent said he would surely get the $500. "Was Bondini merely a dummy intended to show off the skill of Houdini?" Nobody answered except the press agent. "The real thing," said he. I read this story in the 4th grade, I had long looked for a copy. Most folks never knew what I was talking about. Thanks for posting. Oh, good, I'm happy that I could bring it to you, Streamwood. Yes, it is a very obscure Houdini story. Ha! The reporters didn't entirely buy it. They smelled a put on. That was really fun to read. I appreciate that you had also taken the time to transcribe the NY Times piece. It is such a perfect, point-by-point description of the events (even including the obligatory skepticism) it almost sounds like the journalist was also "paid off" for his account! But hopefully it was just a lucky "accident" for Houdini. Not easy to get such ideal press for a possibly bogus event! BTW, how do people feel about more "encore posts" like this?